The Parish of Kirkbean in Dumfries and Galloway, south-west Scotland, is steeped in history, especially maritime. Among its most famous sons was John Paul Jones, the founder of the United States Navy, who was born in Kirkbean on July 6th, 1747. Kirkbean is also the birthplace of another great seafarer, John Campbell, born in 1720 and who went on to become a British naval officer, navigational expert and colonial governor of Newfoundland in Canada. The parish was also the departure point for thousands of Scots seeking a better life in the American and Australian colonies during the late 18th and early 19th centuries. Convicts were also transported to Australia from here, making the parish a rich source of genealogical history, with many hundreds of thousands of people worldwide having a connection to this beautiful part of Scotland. It is because of this that residents of the Parish established the Kirkbean Parish Heritage Society, the aim of which is to promote and preserve the rich history of Kirkbean Parish. Please check back regularly as new information will be added to this site on an ongoing basis. We also welcome new members to the Society. Membership is open to anyone who wishes to support our aims and objectives, regardless of whether they live in the Parish or not. You don’t even have to live in Scotland, but, through membership, may wish to establish closer links to an area which may well be significant to your family history. Email us for details at: heritagesociety@kirkbean.org. John Paul Jones, father of the United States Navy, was born in Kirkbean on July 6th, 1747. 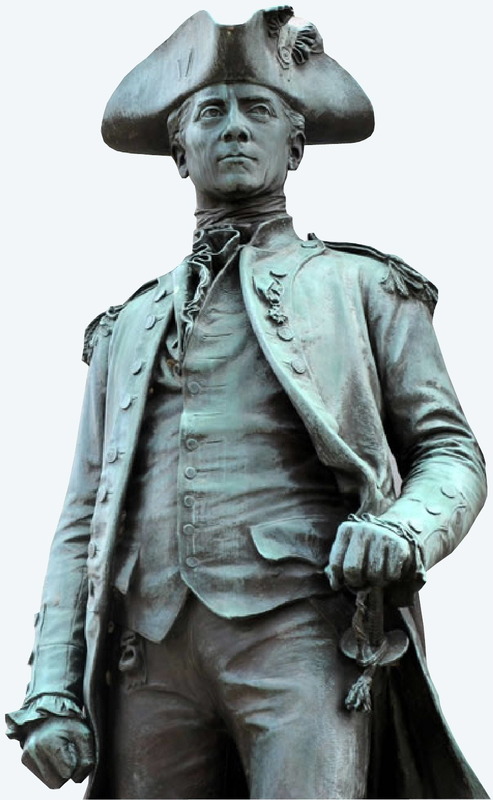 This statue of him is at the United States Naval Academy in Annapolis.